Bleeding or tender gums can allow bacteria to flow into your system, leading to potentially serious problems. So when you make regular appointments to have your teeth cleaned and examined, you are not only caring for your oral health, but your overall health as well! Does daily flossing really help? Daily flossing and brushing (water pik is good too) is the KEY to preventing gum disease and tooth decay ... makes it harder for bad things to happen. 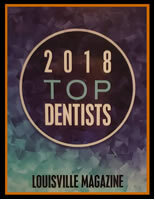 Blincoe and Shutt Dentistry is located in the heart of St. Matthews and is easily accessible from anywhere in the Greater Louisville area.